New for the 2017 collection, Klim brings us the Klim Kodiak Jacket. 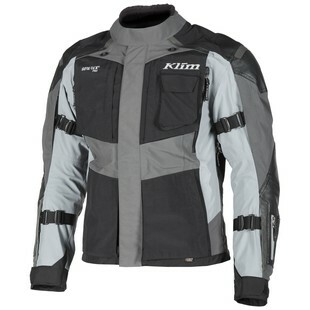 Tough enough for any riding condition, this jacket has a new, more tailored fit, while offering all of the premium materials and features you would expect from Klim. The Kodiak Jacket comes with the top of the line GORE-TEX Pro laminate construction allowing you stay dry and comfortable in whatever weather comes your way. This jacket also boasts a bevy of vents (10 to be exact) allowing tons of air flow when in warmer conditions. The Kodiak comes fully outfitted with D3O CE level 2 shoulder, elbow and back armor for maximum protection. The most notable change is the departure from the generous fit we have grown accustomed to from Klim. The Kodiak Jacket features a refined, slim fit for riders looking for a more tailored look. Overall, the Kodiak Jacket has been designed to take the adventure rider through the harshest conditions while providing the maximum level of safety.